GALWAY’S VIBRANT children’s arts festival Baboró has unveiled its line-up for this year’s programme and, as ever there’s a wealth of colourful, magical, and enthralling shows on offer that are sure to captivate audiences both young and old. This year’s festival features companies from Italy, Denmark, Spain, Scotland, and Germany as well as Ireland and the programme line-up includes opera, dance, and puppetry among its myriad delights. 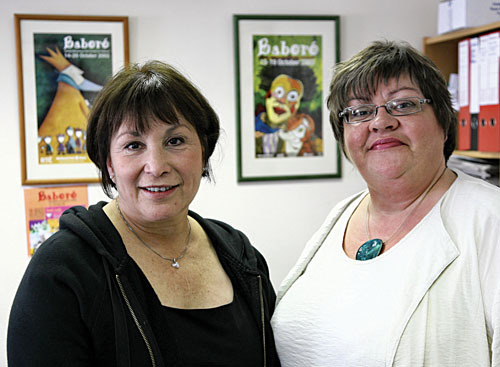 Over a morning coffee Baboró director Lali Morris and general manager Teenagh Cunningham outlined some of the festival highlights and discussed its broader role in the promotion of arts for Irish children. There’s a special focus on work from Italy this year with three shows from the country, including the visual theatre piece I Colori dell’Acqua/The Colours of Water from Bologna’s La Baracca company. “They’re a very well respected company,” Morris reveals. “Their director Roberto Frabetti has just won an international award for the excellence of his theatrical work for children. He’ll be coming to Galway to give a talk during the festival. “Baracca’s work in Italy even extends into crèches and they do a lot of work with teachers in developing imaginative, creative, ways of play. This is a very big thing in Italy at the moment where they’re finding ways to nurture children’s imagination and creativity throughout the whole education process. Another highlight is the opera production for children Schaf!/Sheep which comes from Germany. It relates the witty and entertaining story of a sheep who is tired of being one of the crowd and sets off on a madcap journey in search of the perfect name. Morris is also excited about the visit of Madrid’s dance company Aracaladanza with Pequenos Paradisos /Tiny Paradises. The show presents a sequence of beautiful dances, glorious colours, strange props and wonderful puppets from the moment the curtain opens. Amid all the colour and fun and quirkiness, Baboró also has room for stories of a darker hue, such as the three shows from New International Theatre. My Long Journey Home relates the true story of Andras Tomas, a Hungarian boy conscripted into the Wehrmacht and sent to fight in Russia – there he was incarcerated until 1999 when he finally returned home. Past Half Remembered is about an old lady who has lived through the calamitous upheavals of the Soviet century and The End of Everything Ever tells about a young girl swept up in the WWII Kindertransport project in which thousands of Jewish children were rescued from Nazi Europe. As well as the performances, Baboró also features a range pre and post-show talks and workshops designed to maximise the various shows’ impact on their audiences. In discussing this strand, Morris emphasises Baboró’s close relationships with schools and teachers. “Teachers are like the gatekeepers,” she observes. “They hold the key to deciding what kind of shows the children will be brought to see. I can understand how teachers might be hesitant about bringing children to a show they don’t know anything about so when we have performances that are based on stories they feel confident in, like Goldilocks or Cinderella they feel it’s ‘safe’. “Interestingly enough, this year there aren’t any of those shows you could call safe so they really have to trust us and as the years have gone by I notice more and more that teachers are willing to trust us in that way. Baboró manager Teenagh Cunningham expands on the festival’s work with schools. “We post programmes to schools in five counties even before programme is officially launched. We also send out a ‘teacher pack’ which has a lot of pre-event activities the teacher can do with the pupils prior to them going to see the show. So we create a worksheet around the elements of each show. Baboró runs from October 13 to 19 and full details of its programme can be seen at www.baboro.ie while bookings for the events can be made at the Town Hall on 091 - 569777.